Whether it’s Twitter, Facebook, or some other social networking service, I believe the lighter weight communication paradigm (say less, reach more) is superior to email for many things. 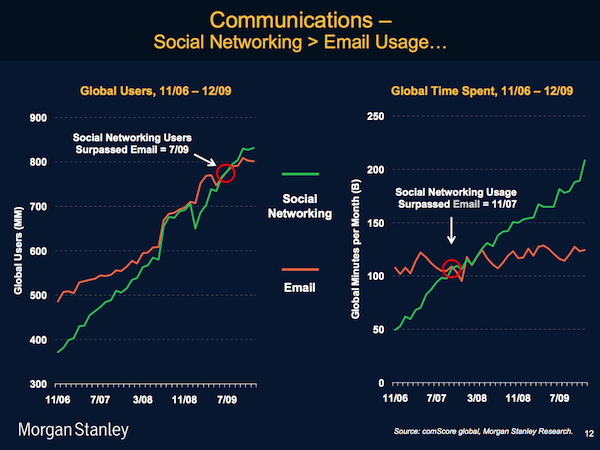 Nonetheless, email’s usage is still growing and IMHO is more suitable for long-form serious private conversations. As ever more Americans go online instead of sending paper, the volume of mail has been plummeting […] Delivery costs are simultaneously going up. As a result, the post has lost $20 billion in the last four years and expects to lose another $8 billion this fiscal year […] As Christmas cards have gone online (and “green”), so have bills. In 2000, 5% of Americans paid utilities online. Last year 55% did. USPS is planning to close post offices; up to 3,653, out of about 32,000. This month it announced plans to lay off another 120,000 workers by 2015, having already bidden adieu to some 110,000 over the past four years (for a total of about 560,000 now). It also wants to fiddle with its workers’ pensions and health care. The post will have to stop delivering mail on Saturdays. Then perhaps on other days too. USPS was born “to bind the Nation together”. Now it looks like there is a substitute: Internet.